We met once a week at a neighbor's home for Bible Study. Everyone knew they had two dogs but not a cat. They would put the two dogs in the bedroom at the start of study and let them out at the end. A couple of weeks into the study, out walks a beautiful Calico cat. It was not timid and made the rounds so each of us could say hello and admire her. She would move from chair to chair until the end of our meeting at which time she would fly up the stairs as she knew the dogs would be let out soon. That was the only time she would come downstairs as she did not care for them. She performed this ritual once a week right up until the end. 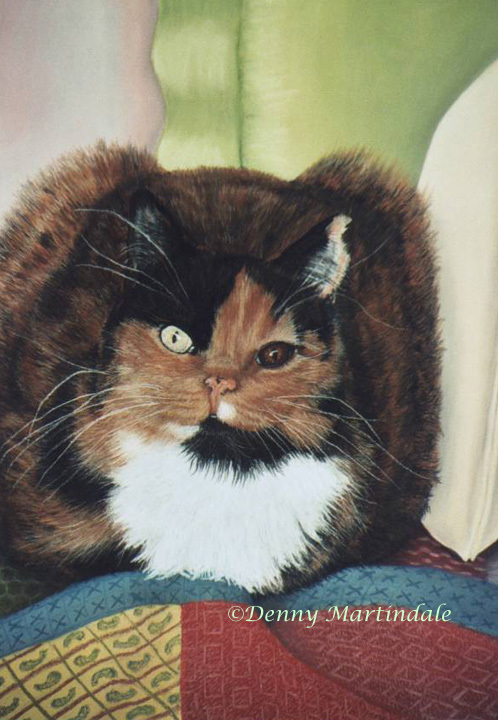 Her owners asked me to paint this 14" x 11" pet portrait in pastel.